Who are we? Historic Rugby is a 501 (c) (3) membership based nonprofit dedicated to the preservation and interpretation of a restored Victorian village founded in 1880 by British author and social reformer, Thomas Hughes. Named after Thomas Hughes’ alma mater in England, Rugby was originally conceived as a class-free, agricultural community for younger sons of English gentry and others wishing to start a new life in America. At its peak in the mid-1880s, some 300 people lived in the colony. More than 60 buildings of Victorian design graced the townscape on East Tennessee’s beautiful Cumberland Plateau. By 1900 most colonists had left for other places, but we are fortunate that enough folks remained in Rugby to ensure that it survived to present day. Please read more about the fascinating history of Rugby under the heading History of Village. Today Rugby is both a living community and a fascinating public historic site run by Historic Rugby offering visitors a museum, historic building tours, lodging, stores and a full service restaurant. Many original buildings still stand, nestled between the Big South Fork National Recreation Area and the Rugby State Natural Area, surrounded by rugged river gorges and historic trails. 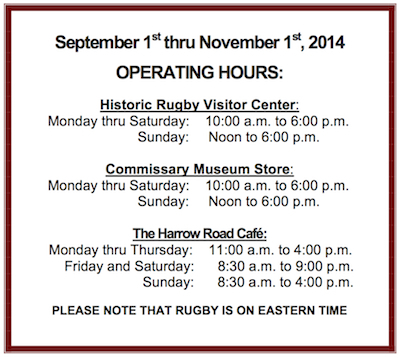 Historic Rugby has been open to the public since 1966 and is nationally recognized by the National Trust for Historic Preservation. You can read more about the history of our organization, Historic Rugby, under the heading History of Organization. You can find out more about our community under the headings Rugby Today and Community.